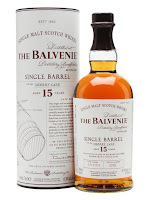 Back with Balvenie reviews today from my time at The Whisky Exchange Show 2016. Nose: Lovely, fresh, honey, sweet floral notes, vanilla, malt, fresh fruit. Taste: Quite full, fresh fruit, apple and pear, oak spice, vanilla, then more pear. Finish: Medium length. Malty with oak. This is from a 1st fill Bourbon barrel. Didn't get the barrel number I'm afraid. 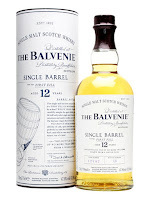 Nose: Fruity, malty, some light Sherry, probably 2nd fill, cask char. Taste: Sweet, malty, nutty, slightly rubbery, then tannins. Finish: Medium length. More tannins, a little harsh bitterness. From a Sherry cask, I'm guessing 2nd or 3rd fill. There are some of these with a much darker colour. Nose: Lots of oak, dry, honey, spice, dry ginger, pressed flowers. 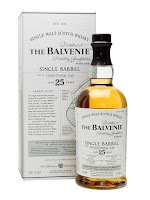 Taste: A honeyed/floral Balvenie, oak and tannins, spiced with dried orange peel. Finish: Medium length. Lots of oak in the finish with tannins. This was from barrel 1868 which was a 3rd full Bourbon barrel. The oak feels. Out of these, I think the 12 was my favourite. Although because every barrel is different, it is likely that the quality is quite changeable. I can image that a fresher Sherry 15 would have done better. Oh well, these can be quite expensive anyway, especially the 25.